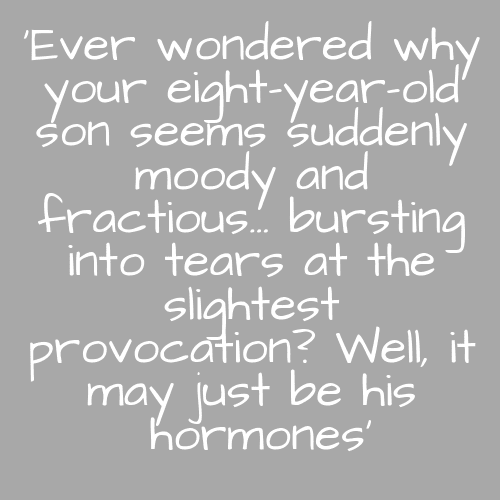 I totally thought that there was a good couple of years left of my lovely, rational little boy before puberty came to wreck it all for a while, but no apparently this malarkey starts before all the physical changes and it is a tricky time for us all living with 8 year old boy hormones! For the past couple of months my usually kind, loving and generally well behaved little boy has become unbelievably angry and emotional. The slightest thing can set him off even me asking him to put his shoes on which last weekend prompted him to lie on the floor sobbing… To start with I put this down to a growth spurt as he does tend to act out when he is growing and doesn’t sleep well so gets grumpy, but then it just carried on and it wasn’t all the time so one minute I would have my lovely little one wanting to cuddle on the sofa and next this angry brute throwing his (rather little) weight around. I started to think there must be something wrong and wondered if there was an issue at school that he wasn’t telling me about, but no his teacher hasn’t seen any change in his behaviour. In fact he was given a certificate for being such a good friend to his classmates. At home it was a different story with him losing his temper with his brother and sisters regularly. I tried talking to him to see if I could help as I do appreciate that our house is chaos and having three little siblings must be a lot to deal with, but he just kept saying no he was fine and then the next minute he would be so we carried on. He and I spent a good bit of time talking together about feelings and looking at books about stress etc… to help him explore what was making him be so very emotional, but he just kept saying he didn’t know why he was getting cross or upset. Then one day he told me he hated me and that I was the worst mummy in the world. I think I asked him to come to the table for dinner…. I was upset and so was he. He looked horrified as he said it and then cried and cried saying that he didn’t mean it. I also noticed that he was waking in the night and coming to my bed. He said he needed to have more cuddles and just seemed to want to be with me. It was very sweet, but just a bit odd so I was getting concerned again that something was wrong. Around that time I saw posts on instagram from Mom of 2 little girls who also has an almost eight year old (girl) and she was experiencing similar emotional issues with her little one. She has written a great post about her experiences and those of others which yours truly also threw my two pennies worth in on. I also chatted to other mums at school and whilst not all of them had been seeing any issues with their little people enough of them were for me to start wondering if this was just a normal phase for almost 8 year olds. So off I headed to Dr Google! It seems that I am not going crazy and fortunately my little boy probably isn’t just turning into a nightmare it probably genuinely is his hormones and changes starting to happen. Scientists have discovered an earlier hormone surge that happens prior to puberty around 8 years old. It is called Adrenarche or Adrenal Puberty and doesn’t encompass any physical change, but does impact their emotions and relationships. That literally sums up my lovely little boy at the moment. How I am dealing with it? Well first I had a bit of a tear about the fact that he is growing up (that is just par for the course for me. I mourn every time I notice that they are getting big ;)) I then started to think about how I could help him. I mean clearly if his emotions are being driven by hormones it is hard to control it, but I still feel like he has to learn to manage those feelings. We started by talking about what hormones were and that they might be making him feel this way. He asked lots of questions so I think he found it helpful to understand as he certainly seemed confused by his emotional outbursts or sobbing fits. I also felt like I could be more patient with him now that I understood what could be driving the behaviour, but this doesn’t mean we are going entirely softly softly. We can’t simply tolerate him being disrespectful to me or unkind to his siblings so there still must be consequences like losing that all important time on electronic devices. I am just trying to implement it without any further upset or heartache. He has to understand that we can’t all run around having tantrums every 5 mins (I am still a work in progress on this front so I would rather he nailed that now). I remind him when he gets cross about the hormones and try to give him a cuddle so he knows he is loved whilst he grows through his emotional moment. We have also pushed his bed time back a bit. He was getting an extra 30 mins staying up each evening, but now since this has started he looks so tired that we have gone back to the earlier time so that we maximise the amount of sleep he is getting. I don’t know if it helps, but I know I am impossible to live with when I am tired. Imagine my poor long suffering husband as I have essentially been tired since 2011! I honestly don’t know if I am dealing with this the right way, but as with any parent you can only do what you think is right. Hopefully by being supportive and yet firm I can teach him that we need to talk about our feelings and find ways to let out emotions that don’t involve shouting and hollering or kicking our little brother… If you have any tips for how I can help him through this I would absolutely love to hear any ideas especially if you have just been through parenting a child in year 3 or 4. I am not an expert I am just another mummy trying to do her best so all suggestions are gratefully received. Empathy is the biggest factor here, realising that he cant control it aNd doesnt eVen understand what The deal is. It seems to me you have this in spades. It is a difficult situation though. I’m trying but must admit it is tough when he is screaming at me! I love the idea of kids meditation tracks & must look this up further. my dear friend sadly passed recently leaving behind 2 young boys who are terribly afraid of the dark and generally just won't sleep. This may be helpful for them too. #dreamteam Isabel recently posted...Is plastic recycling really greenwashing? That is sad to read. I hope that it does help them to get some rest.